The Philippine media is in love with purveyors of pseudoscience. A few days ago, we wrote about a tarot reader and self-proclaimed feng shui expert dishing out health advice on the medical television program Salamat Dok on ABS-CBN. It was saddening to watch because instead of getting science-based health advice, viewers were being blatantly fed stuff that have no place in a medical advice program. The tarot reader's appearance on the show was in full conflict with the show's purpose which is to show people how to stay healthy through the advice of learned doctors and medical personnel. Now, we have Unang Hirit, a morning show on GMA, inviting an astrologer to talk about what's in store for Filipinos and the Philippines in general for this brand new year. 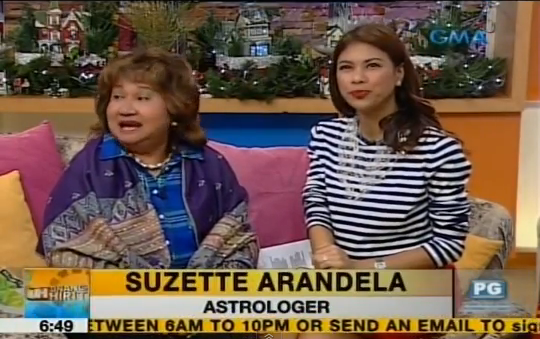 The astrologer named Suzette Arandela aka Madam Suzette and the five hosts of the show spent nearly eight minutes talking about people being lucky in love or lucky in travel based on their Chinese zodiac signs. This is an annual affair in the Philippines and in many other parts of the world. When a new year rolls in, the airwaves and the tubes are bombarded with these "lucky star" and "predictions" stuff. For people who are aware of how non-sensical these are, watching television can induce a lot of head-shaking and teeth-gnashing. Arandela talked about avoiding negative vibrations (whatever this means) and dished out tips like, "Iwasan yung tsismis kasi maraming jealousy na nakikita ko sa taong ito." Okay. She added that crystal has natural healing power. There's not a thread of evidence for this, of course. And yes, natural disasters, they will be wrecking havoc to the Philippines this year, says Arandela. Filipinos will be facing a lot of earthquakes and flash floods. The thing is we face these every year. You don't need an astrologer to know that earthquakes and flash floods will be hitting the archipelago. Arandela is turns out is also an economist. We are just two days into 2015 and she says (without batting an eye) that this year's economy will be better than last year. Maybe the Malacanang Palace should consider taking her into its fold as an economic adviser. Philippine politics this year according to the astrologer is going to be "medyo magulo". Philippine politics has always been "magulo". This prediction is similar to saying Sunday will follow Saturday. Arandela also seems to have psychic powers. If you are a fan of the sport of boxing, raise your hands and rejoice because according to the astrologer, the highly-anticipated slugfest between Manny Pacquiao and Floyd Mayweather Jr. is going to happen. If not this year, then in 2016. What's makes this even more saddening are the ooooooohs, aaaaahhs, and yeheys of the show's hosts. They know that the stuff they are pushing is nonsense, but they do it anyway. Okay, it's their show and they can say anything they want in it. And they can also invite anyone they fancy. Still, this doesn't take away the fact that they made fools of themselves and their viewers.